Queen Paola of Belgium (born Donna Paola Ruffo di Calabria on 11 September 1937) is the wife of the former King Albert II and was Queen of the Belgians from 1993 until his abdication in 2013 in favour of their son King Philippe. She was born in Forte dei Marmi, Tuscany, Italy, the seventh and youngest child of the World War I Italian flying ace Fulco, Prince Ruffo di Calabria, 6th Duke of Guardia Lombarda (1884–1946). Her mother was Luisa Gazelli dei Conti di Rossana e di Sebastiano (1896–1989), a matrilineal descendant of the Marquis de Lafayette, a hero of the American Revolution. She is of Italian and Belgian ancestry and was hailed as one of the leading beauties of Europe in her youth. Queen Paola is fluent in Italian, French, German and English. Less fluent, and the cause of occasional criticism, is her Dutch, the mother tongue of nearly 60 percent of Belgians. Ademarus Rufus, who died in 1049, held the title of Comes in southern Italy and Siggerio Ruffo became Holy Roman Emperor Frederick II's grand marshal of the Kingdom of Sicily in 1235. The family divided into two branches after the 14th century: the Ruffo di Calabria and the Ruffo di Scaletta, to the former of which the Queen belongs. Queen Paola's brother, Don Fabrizio Ruffo di Calabria-Santipau (1922–2005), head of the entire family from 1975, was historical heir to the titles of Prince of Scilla, Prince of Palazzolo, Duke of Guardia Lombarda, Count of Sinopoli, Marquis of Licodia Eubea, Count of Nicotera, Baron of Calanna and of Crispano, Patrician of Naples. Queen Paola is related to historically eminent Roman and southern Italian noble families, including the Colonna, Orsini, Pallavicini, Alliata and Rospigliosi. Among her distinguished ancestors of the French aristocracy were the American general Gilbert du Motier, Marquis de Lafayette and the Dukes of Noailles. Since the fall of the Italian monarchy in 1946, the Princes Ruffo di Calabria have become connected by marriage, in addition to the Belgian royal family, to such formerly reigning dynasties as the Orléans, the Savoys and the Bonapartes. In 1958, the Prince of Liège went to the Vatican to witness the coronation of Pope John XXIII. At a reception at the Belgian embassy, the Prince met Italian Donna Paola Ruffo di Calabria. "We were both shy, so we only talked a little," Paola said later about their first meeting. Shy but smitten, Prince Albert later proposed marriage to Paola, and she accepted. Their engagement was announced at the Chateau of Laeken in 1959. The Prince of Liège married Donna Paola Ruffo di Calabria at St. Goedele Cathedral in Brussels on 2 July 1959. Philippe, King of the Belgians (b. 15 April 1960), who married Countess Mathilde d'Udekem d'Acoz in 1999 and has 4 children. Princess Astrid (b. 5 June 1962), who married Lorenz, Archduke of Austria-Este in 1984 and has 5 children. Prince Laurent (b. 19 October 1963), who married Claire Louise Coombs in 2003 and has 3 children. In 2015, the court announced Queen Paola was taking "a period of total rest" following doctors' orders. They also announced that she had to cancel a planned visit to the Biennale in Venice. Further communications were kept private. The Queen sent a message to Grosio, where she was expected to visit the residence of her aunt the Marchioness Margherita Pallavicini Mossi. Newspapers believed that the Queen suffered from a stroke during the holiday. The palace later announced she was being treated for a cardiac arrhythmia. 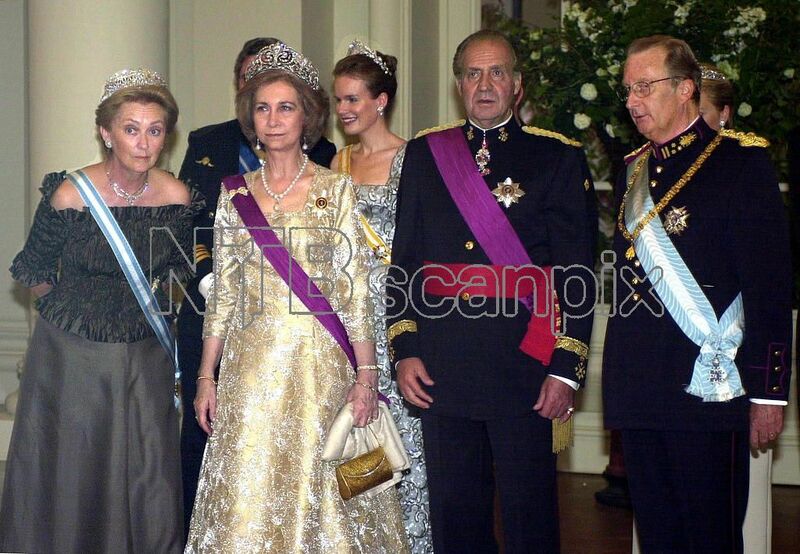 Apart from her activities in the company of King Albert II, Queen Paola devotes her time to issues that are close to her heart, mainly in the social and cultural sphere. Queen Paola has demonstrated interest in contemporary Belgian arts, visiting the Venetian Biennale several times. She has acquired works of Jan Fabre, Michael Borremans and others for the Royal collection. She has often met with such artists as Luc Tuymans and Dirk Braeckman. She takes a keen interest in the protection and preservation of Belgium's heritage. She makes numerous visits to cultural sites, from Beguine convents to early 19th century industrial facilities. Queen Paola is interested in both new and traditional crafts, and takes every opportunity to encourage the exercise and teaching of craft professions. Queen Paola keeps abreast of contemporary art and regularly supports major exhibitions and artistic performances both in Belgium and abroad. On the initiative of Queen Paola, contemporary artists have had the opportunity to design and make original works within the Palace of Brussels. In 1992, Queen Paola set up the Queen Paola Foundation, which focus on integration and training for young people. The Queen Paola Foundation's activities are geared towards social integration, support for teachers at all levels of the education system and schools in socio-economically disadvantaged areas. Queen Paola is Honorary Chairman of the Queen Elisabeth Music Chapel and of Missing Children Europe. Grand Cordon of the Order of Leopold in 1994. ^ Although The Belgian Monarchy website attributes the title of "Princess" to Queen Paola prior to her marriage, Burke's Guide to the Royal Family, The Descendants of Louis XIII, Genealogisches Handbuch des Adels, La Descendance de Marie-Thérèse de Habsburg and Le Petit Gotha, among others, accord only the noble prefix of Donna to her and her sisters, reserving the title Principessa for the wife of the head of the family, Paola's father having received the title of prince in the Italian nobility in 1928 from King Victor Emmanuel III, heritable according to masculine primogeniture. ^ a b c d Genealogisches Handbuch des Adels, Fürstliche Häuser XVI. "Ruffo". C.A. Starke Verlag, 2001, pp. 522–529. ISBN 3-7980-0824-8. ^ "Koningin van België neemt bad Nederlands". volkskrant.nl. 25 November 1998. Retrieved 17 February 2017. ^ "Prince Albert Engagement - British Pathé". Britishpathe.com. 15 April 1959. Retrieved 23 October 2016. ^ "Italiaans dorp ziet Paola weer afzeggen". HLN.be. Retrieved 23 October 2016. ^ "Valtellina News - notizie da Sondrio e provincia » Annullata la visita della regina Paola del Belgio a Tirano e Grosio". Valtellinanews.it. 31 October 2013. Retrieved 23 October 2016. ^ "Koningin Paola kreeg beroerte". HLN.be. Retrieved 23 October 2016. ^ Gert's Royals [@Gertsroyals] (15 November 2015). "The Belgium Palace confirmed that Queen Paola was receiving treatment for Cardiac Arrhythmia" (Tweet) – via Twitter. ^ "Queen Paola". The Belgian Monarchy Official Website. ^ "Koningin Paola bestelt kunst bij Michaël Borremans - Kunst - KnackFocus.be". Focus.knack.be. 20 May 2010. Retrieved 23 October 2016. ^ Willis, Daniel, The Descendants of Louis XIII, Clearfield Co., Inc., Baltimore, Maryland, 1999, p. 100. ISBN 0-8063-4942-5. ^ Enache, Nicolas. La Descendance de Marie-Therese de Habsburg. ICC, Paris, 1996. pp. 54, 58. French. ^ "Le onorificenze della Repubblica Italiana". Quirinale.it. Retrieved 23 October 2016. ^ "Paola et Albert à Rome - L'actualité des royautés". Royautes.ek.la. Retrieved 23 October 2016. ^ "Reply to a parliamentary question" (PDF) (in German). 23 April 2012. p. 53. ^ "The Belgian Monarchy". Monarchie.be. Retrieved 23 October 2016. 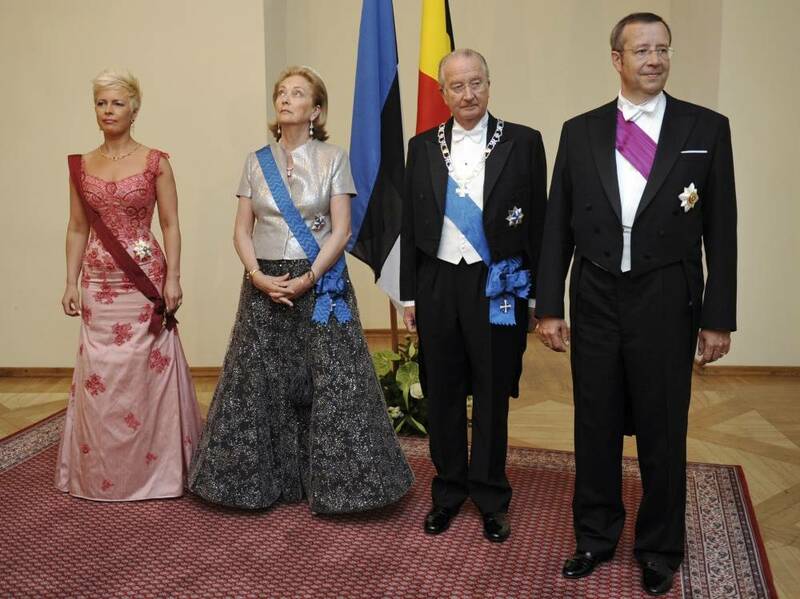 ^ "Finnish President Visit To Belgium - Day One Photos and Images". Getty Images. 30 March 2004. Retrieved 23 October 2016. ^ "Ar Triju Zvaigžņu ordeni apbalvoto personu reģistrs". President.lv. Archived from the original (DOC) on 4 March 2016. Retrieved 23 October 2016. ^ "The late Grand Duchess Josephine Charlotte of Luxembourg nee Princess of Belgium with her sister in law Queen Paola of the Belgians each wear the g… | Pinteres…". Pinterest.com. Retrieved 23 October 2016. ^ "Henri, Grand Duke of Luxembourg and Maria Teresa, Grand Duchess of Luxembou Photos and Images". Getty Images. Retrieved 23 October 2016. 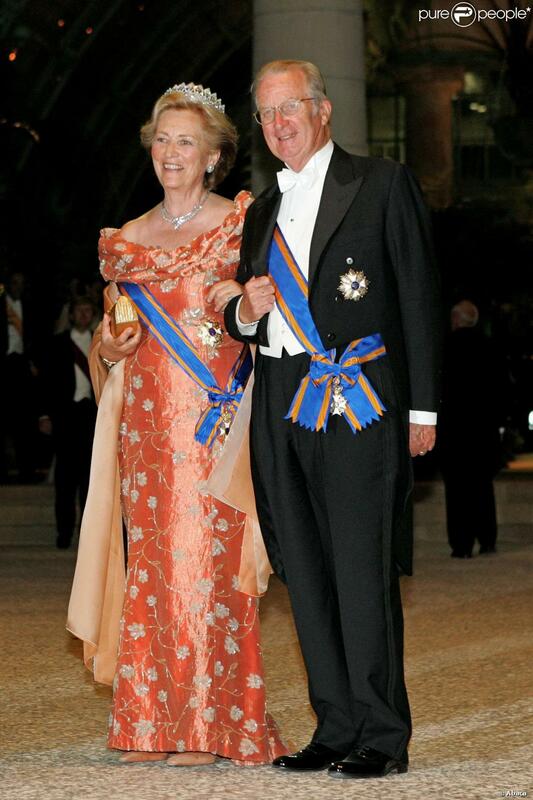 ^ "Photographic image : Queen Paola and King Albert of Belgium" (JPG). Static1.purepeople.com. Retrieved 23 October 2016. ^ "Dutch Royal Family Make State Visit To Belgium - Day 1 Photos and Images". Getty Images. 20 June 2006. Retrieved 23 October 2016. ^ "2006.06.20____.jpg (image)". 4.bp.blogspot.com. Retrieved 23 October 2016. ^ "Photographic image" (JPG). Upload.wikimedia.org. Retrieved 23 October 2016. ^ "Photographic image : Prinses Beatrix en Prins Claus" (JPG). Upload.wikimedia.org. Retrieved 23 October 2016. ^ "Norwegian Royals Make State Visit To Belgium Photos and Images". Getty Images. Retrieved 23 October 2016. ^ "Portuguese State Visit To Belgium Photos and Images". Getty Images. Retrieved 23 October 2016. ^ "Photographic image" (JPG). 3.bp.blogspot.com. Retrieved 23 October 2016. ^ "Queen Silvia wore this tiara for one of the dinners during the Swedish State Visit to Belgium in May 2001. | Cameo Tiara | Pinterest | The Dinner, Belgium and …". Pinterest.com. Retrieved 23 October 2016. ^ "Editorial & News Images: News Photography, Pictures, Awards, Events, Sports, Celebrity Photos | Getty Images". Corbisimages.com. 2 May 2016. Retrieved 23 October 2016. Wikimedia Commons has media related to Queen Paola of Belgium.